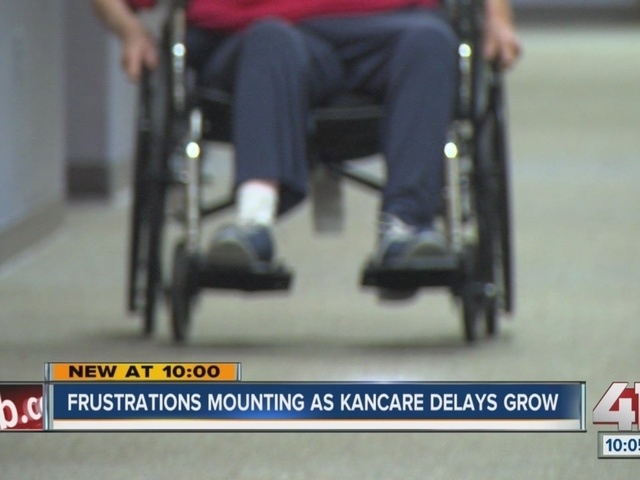 A Johnson County nursing home is waiting on hundreds of thousands of dollars from KanCare due to delays in the application and reimbursement process. Between 75 and 80 percent of the residents at Evergreen Community are on Medicaid, several with applications that have not been approved. Interim CEO Chris Osborn said, "Those dollars start adding up very quickly and we're several hundred thousand dollars in back payments right now through the Medicaid system." There have been some changes. Starting Jan. 1, KanCare eligibility determination was shifted to the Kansas Department of Health and Environment. This is on top of a new computer system at the state that was implemented mid-summer. "We have approximately 10,000 pending applications for all Medicaid populations. There are a number of factors that have contributed to the pending applications including, federal open enrollment season, which ended Jan. 31. We are taking steps to address and eliminate the pending applications for all Medicaid populations. We have added and redeployed staff to increase application processing capacity and continue to make system improvements to decrease application processing times." Ruth Martinez has helped her mom with her KanCare application for the last nine years. Last year was different. "I hadn't heard anything back for a few months so I called, waited on the phone 50 minutes. Got someone and said, 'Your mom's application has been denied,'" Martinez said. "It's got to be frustrating to them and it's not just my mom. I'm sure it's other residents and then other people I think of that don't have advocates to help them with this whole application process. What's happening to them?" Her mom has not been covered since August 2015. Osborn says they have several people who have been without KanCare for more than six months. "The longer those dollars are out, the more difficult it could become to provide care," said Osborn. "We are not at this point looking at discontinuing Medicaid individuals moving in to Evergreen Community, but I've heard that other organizations have been looking at that." Once a person becomes eligible for Medicaid, the application is considered approved as much as 90 days before. That means it will retroactively pay for coverage during that time period. As for the rest, it comes out of the resident's Social Security each month until it is paid in full. For many, that could mean years. In a situation where they die, the outstanding balance would no longer be collectable. "Everyone loses. The residents are potentially affected, the individual nursing homes are affected, the employees there. When you're talking about the budgets and being able to stay open for business, everyone could be impacted," Osborn said. Debra Zehr, the president and CEO of LeadingAge Kansas, the statewide association of nonprofit and faith-based long-term care providers that serve 25,000 senior Kansans and their families around the state, told Action 41 News, "The state needs to act immediately to address this unacceptable and growing backlog of Medicaid applications. Our most frail seniors in need of nursing care are the ones who are in jeopardy." Osborn is remaining optimistic because "we're hoping that they'll get this process under control and get that from application to approval time minimized so that we can start getting paid in a timely manner. The need for care doesn't stop because we're not receiving payment." Meanwhile, people like Martinez are frustrated with the system but grateful for a facility that is continuing to care for her mom while payment is stalled. Martinez added, "I'm just happy they're letting her stay here."